A few weeks ago, I got an issue of “Wired” magazine in the mail. It said something about my new subscription. I thought it was weird, and was going to look into it, but then I got busy and forgot. A few days ago, another issue came in the mail. I still had’t done anything about it up until yesterday. 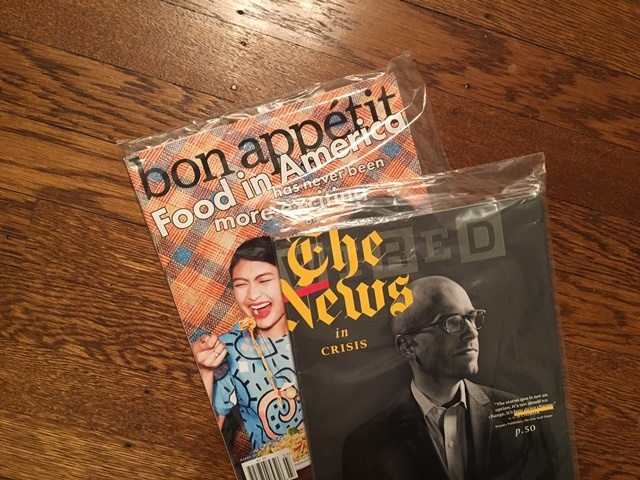 Then yesterday, I got an issue of “Bon Appetit” magazine. This was getting strange. I checked my bank statement, and don’t see anything strange, but still… I’m a little nervous. Why are random magazines being sent to my house with my name on them? I’m curious about their contents, but haven’t taken the time to look in them. I haven’t gifted you with a subscription, but now I wish I had. Dang it. That’s a good idea.